The Bonhams Spring Sale at Stafford is always a bellweather auction for the European scene, and this year Bonham’s two-day sale is choc-a-bloc with a mind-boggling array of truly historic machines. 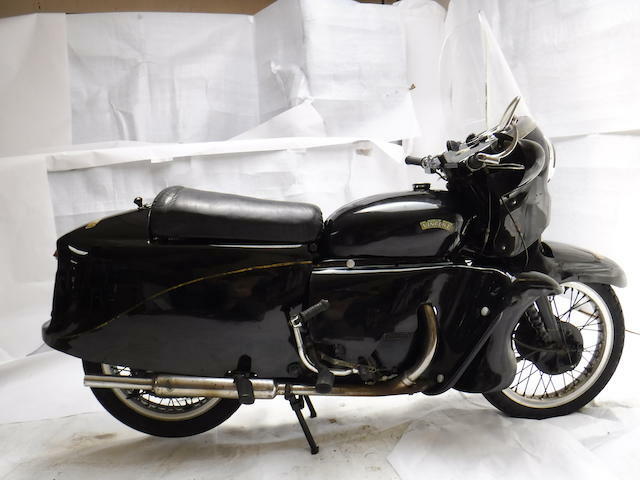 Give the full online catalog a view to see what we mean, but just the spares / basket case selection is tempting, like Manx Norton or Velocette KTT engines or whole projects, and other complete-looking Vintage flat-tankers needing your love and time. There’s also an incredible array of vintage off-road racing machinery, including several historic ISDT winners, among the ‘ordinary’ exotica from around the world and from every era of MX racing. We’ve sampled just a few of the amazing machines – give the catalog a look! employed the pre-unit construction design, and one of the most sparsely found post-WW2 Triumphs. After Ekins’ win in West Germany, the 650 racer ended up in the hands of moto-frame guru Eric Cheney, who in 1989 sold it to his pal, Bob Gardiner. That same year Gardiner received a ’62 ISDT poster along with the Bud’s Gold Medal trophy cup — both items which are included in the sale of this ex-Ekins TR (which was authenticated by Ekins himself). Though the front fender has been replaced, this #5 machine (which has less than 4,500 original miles) is otherwise as it appeared when campaigned by Ekins in ’62, making it a very prized and unique piece of motorcycle history. 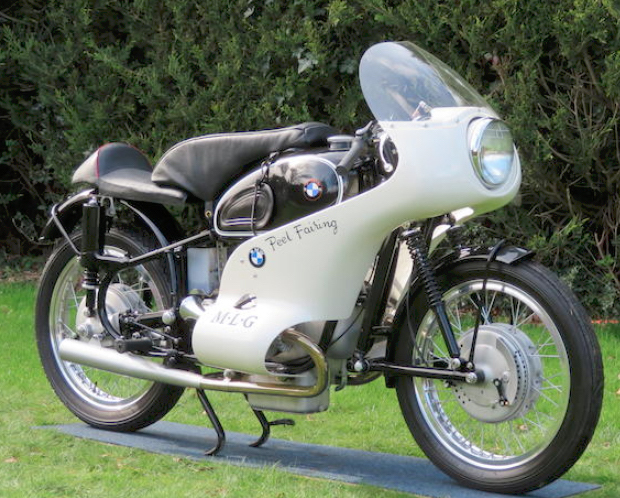 In March of ’61 UK-based BMW dealer MLG built a pair of boxer twin racers to compete in long-distance racing, and to attempt to break the 24 hour record at France’s Montlhéry circuit. Despite Velocette being the first to take the record earlier that year, with an average speed of 100.5mph for a full day, it wasn’t long before the Birmingham-based brand’s record was beaten by one of MLG’s specially-prepped R69S by almost 10mph thanks, to an average pace of 109.24mph in the 24hr [and an extra 100cc – pd’o]. The MLG BMW — campaigned by riders Ellis Boyce, George Catlin, John Holder, and Sid Mizen — also set a slightly faster record over 12 hours, with an average speed of 109.39mph, not to mention its various successes later that same season at the Silverstone 1,000, and Barcelona 24hr races. 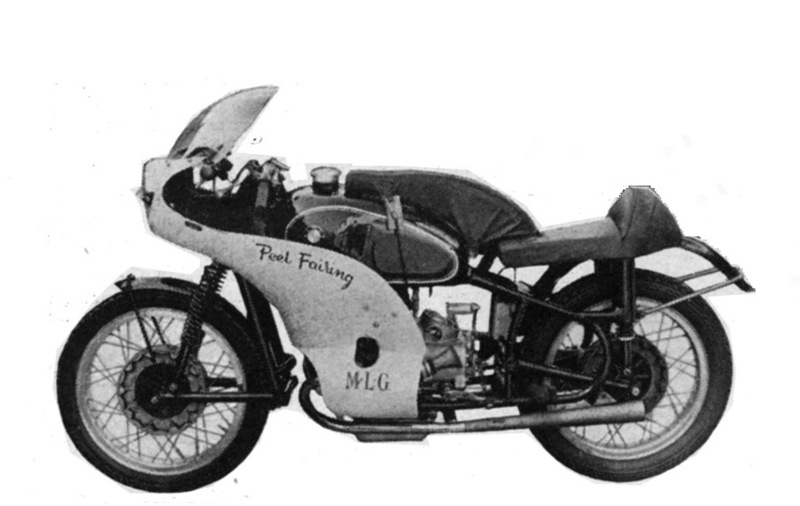 After its illustrious ’61 season, this MLG racer traded hands on numerous occasions before ultimately coming into the possession of the current owner in 1999, seven years prior to undergoing a professional restoration which included the addition of a new “Peel-style” fairing (from Sprint Manufacturing). Because of this restoration, there are a number of key differences between how this machine appears today versus when it was campaigned almost six-decades-ago, such as the chassis — which appears to have been replaced) and front shocks. This storied cycle also interestingly has one extra digit in its VIN, though BMW fortunately provides a free service where you can email them a VIN and it will reply with information about the example such as when and where it left the factory, original color, factory options, etc. There is some question as to how much of this machine is the ex-MLG winner: best do some homework before bidding! 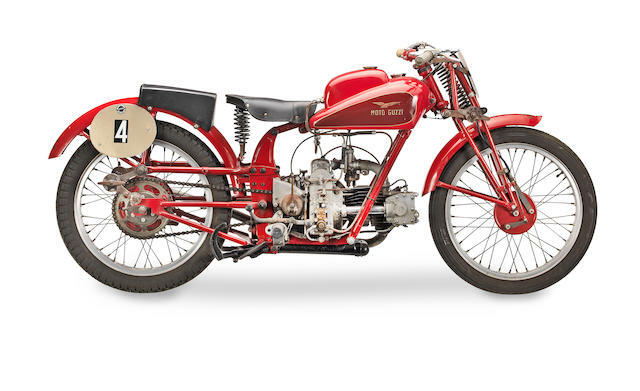 In the early 1920s Moto Guzzi introduced an advanced prototype design with an array of sophisticated features, such as an overhead camshaft, unit-construction motor with geared primary drive, and four-valves per cylinder. It was a far-seeing prototype, and the basic pattern of the laid-down single became the standard for Moto Guzzi production until the late 1960s, when their 90deg V-twin was installed in a motorcycle chassis. While Moto Guzzi became known for their outrageous Grand Prix racers in the 1930s-50s, with one, two, four, and eight cylinders (all designed by the genius Giuliano Carcano), it was the humble flat single that ordinary riders got, and they were excellent, beautifully engineered machines. 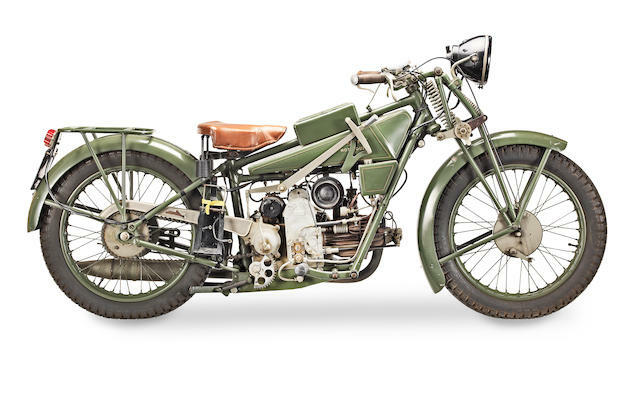 By 1923 Moto Guzzi unveiled a production version of the prototype known as the “Normale”, though it differed from the original in a myriad of crucial areas, namely, its inlet-over-exhaust valve setup — a decision made in an effort to minimize production costs. Over the next decade or two, Guzzi continued to refine its single-cylinder design, introducing a number of updated models along the way such as the Sport 14 in ’28, followed by the Sport 15 and GT 16 models introduced in ’31, and the first overhead street valve models, the V and GTV in ’34. 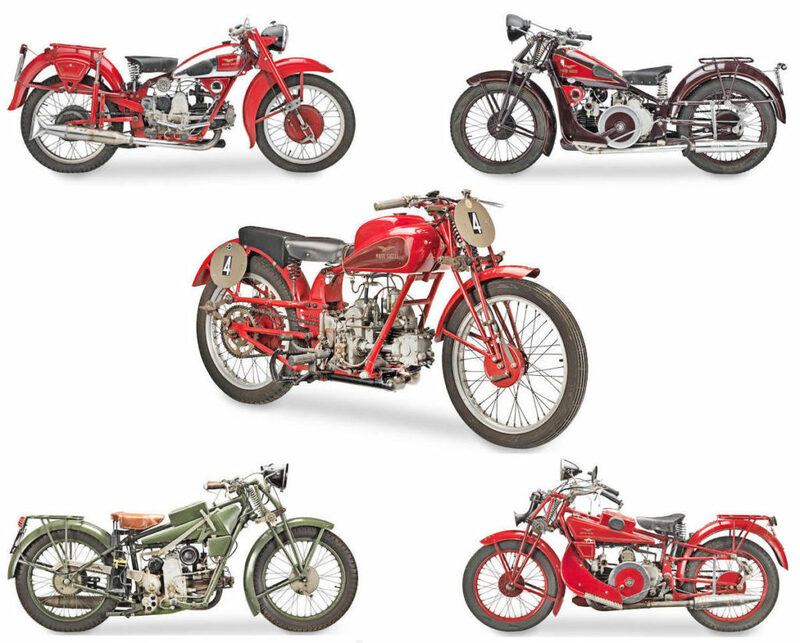 The upcoming Stafford sale will see five beautiful Moto Guzzi singles spanning 11 years from 1928 to ’39. Taking their turns crossing the auction block (in order from oldest to newest) will be a 1928 GT Norge, what’s believed to be a 1930 Sport 14, what’s thought to be a 1932 GT 16, a 1935 250cc racer (comprised of a TT250 engine and various parts from a ‘30s PE250 Roadster), and finally a 1939 Model W. It’s a fascinating lineup, and a rarely-seen timeline of Moto Guzzi development. Building on the success and stellar reputation of the earlier Black Shadow and Rapide, in the mid-1950s Vincent Motorcycles introduced new variants of these models, with protection from the wind and elements, as well as bodywork shrouding the advanced V-Twins. The enclosed Rapide became the Black Knight while the enclosed Black Shadow became the Black Prince. On top of the bulbous bodywork, Vincent also introduced a new frame and rear suspension setup (with a single shock and fully-sprung seat), new oil-tank, and a hand-operated center-stand, while the already impressive engine got coil ignition and Amal Monobloc carbs. Despite Phillip Vincent’s belief that said updates would be the next step in the evolution of motorcycling [and he was right, but too early – pd’o], the general public didn’t feel the same way, preferring the traditional, non-enclosed Vincent offerings. The plight of the Black Knight and Black Prince’s production was then exacerbated by delays of the model’s fiberglass bodywork. 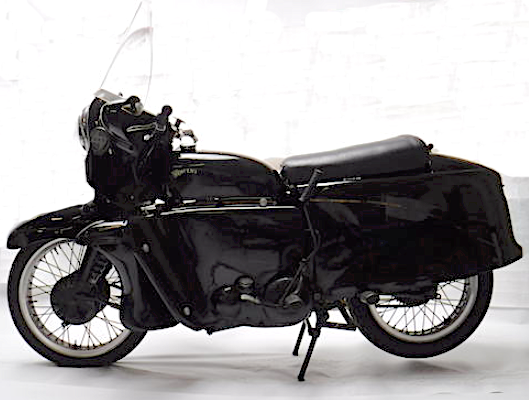 This ultimately prompted Vincent to push out more than half of the planned units sans bodywork, making fully-enclosed examples rare, as only approximately 200 or so ever left the factory. This particular original matching-numbers 1955 Vincent Black Prince hasn’t been fired up in more than a decade, and will undoubtedly require some love. Having said that, this 1955 specimen does boast a number of noteworthy features such as its factory sidecar fittings and 18” alloy wheels. Included in the sale are also the Black Prince’s original handbook, purchase receipt, and a handful of various spare parts. 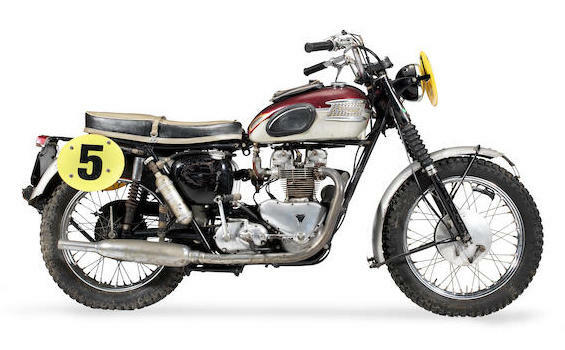 In addition to the collection of flat-head Guzzi singles, the upcoming Stafford sale will also see three noteworthy Beezers cross the auction block. 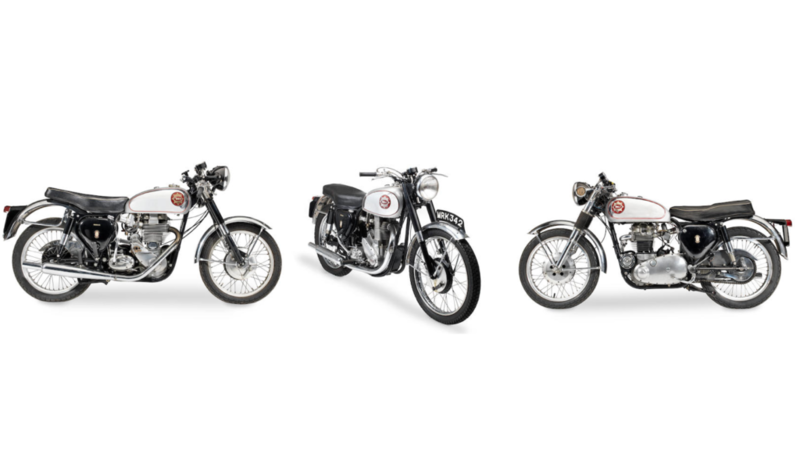 Produced from 1938 to ’63 and offered in (primarily) 350 and 500cc displacements, the Goldie was a staple in the mid-century Clubman racing scene, with a deep record of wins to show for it, and is probably the famed British firm’s most iconic model of all time. 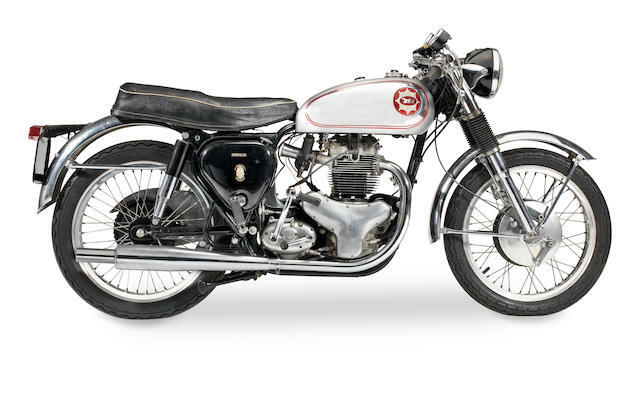 In addition to the bike itself, BSA also offered customers a vast array of factory add-ons and extras, letting owners tailor their respective Goldie to their needs. 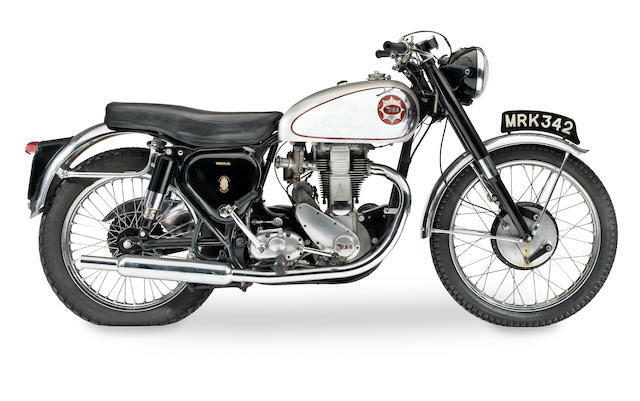 The Gold Star served as the successor to BSA’s Empire Star in 1937 as the M24, and the Goldie was a markedly more potent machine, with the all-alloy cylinder/head that became the trademark of the model. The sporty new offering was a pretty major departure from the Birmingham company’s bread and butter; dependable, no-frills commuter bikes. 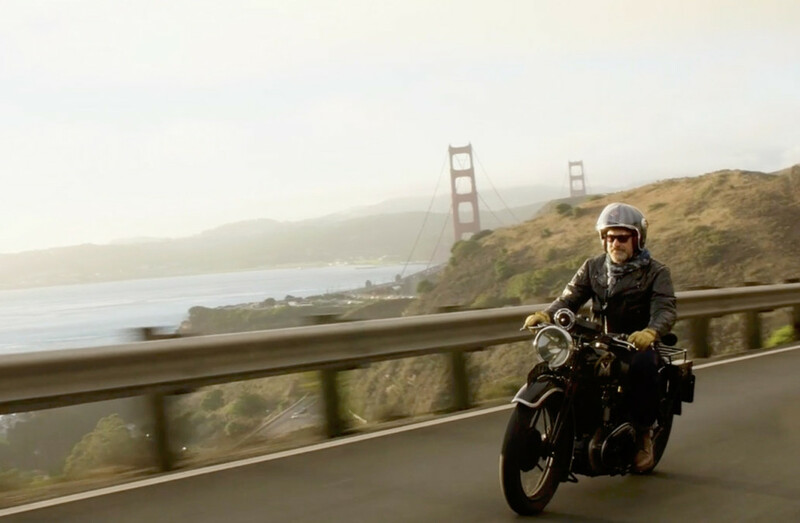 Offered here are three variants of the Gold Star ranging from a 1954 500cc specimen, to a half-liter 1956 Clubman, to what’s easily the coolest of the three, a 1962 646cc Rocket Gold Star Replica. The first-year replica — which was also previously owned by Bob Gardiner — did feature BSA’s then-new unit-construction design, albeit it’s still one of the outfit’s final pre-unit wares. 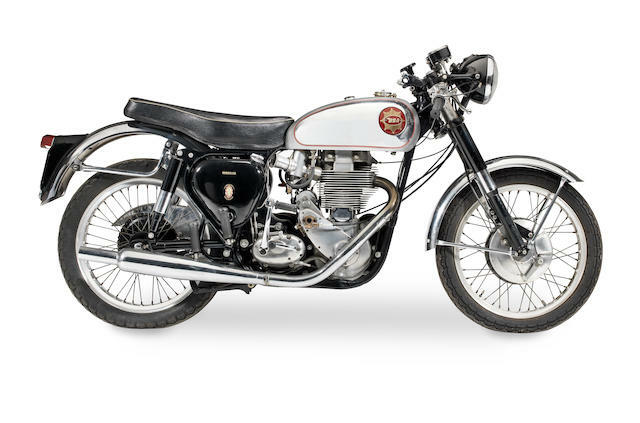 Produced for only two model years, around 1,800 units left the factory prior to BSA pulling the plug. It’s a rare and beautiful factory café racer. The ‘reputed’ MLG R69S for sale at Bonhams forthcoming auction is in fact a nicely constructed ( but not technically correct) replica. 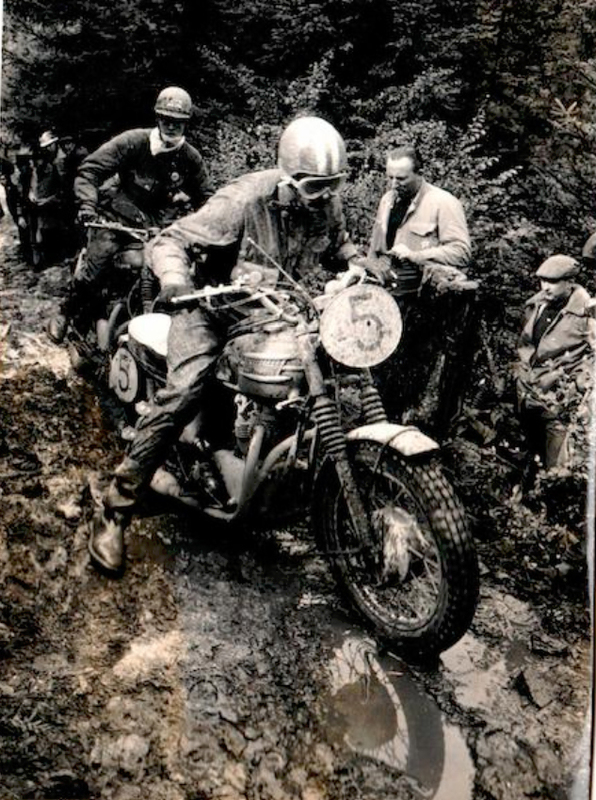 The chassis on the bike, number 655526, was manufactured on the 23rd June 1961 and despatched to the German dealer Hammer in Monchengladbach on 26th June 1961 exactly three months after it supposedly broke the 24hr record! 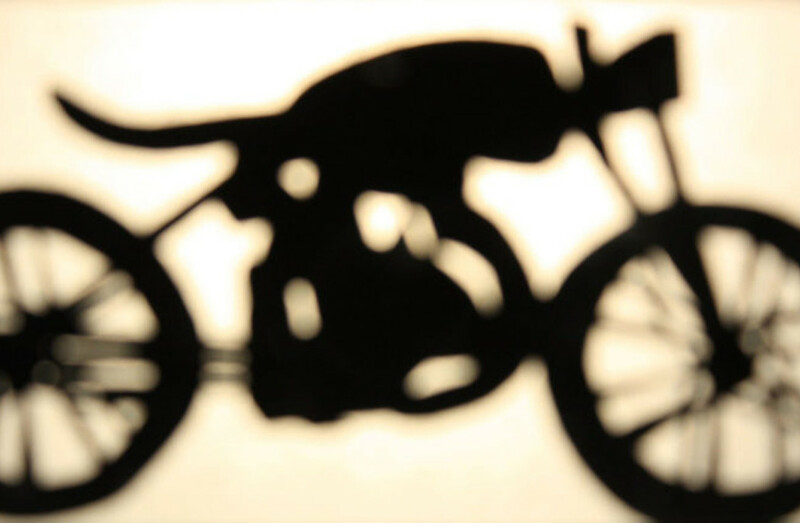 As to the ‘works’ engine supplied for the successful attempt it carried a special number from the factory and not the seven digit number the sale bike carries. These facts can be verified by Fred Jacobs or Andreas Harz at BMW Historic. As to success in the Thruxton 500 mile race in 1961 this was in fact won by Tony Godfrey on Alec Bennett’s (the Southampton dealer) 650cc Triumph. Both MLG’s BMW machines retired in the race, the 24hr record machine suffering a broken inlet cam follower. Hope this puts the historical record straight. So, it’s like Ceasar’s axe, with 8 replacement heads and 47 replacement handles? Sounds like someone at Bonhams needs to do a little more homework… We’ve amended the story to suit the question marks. 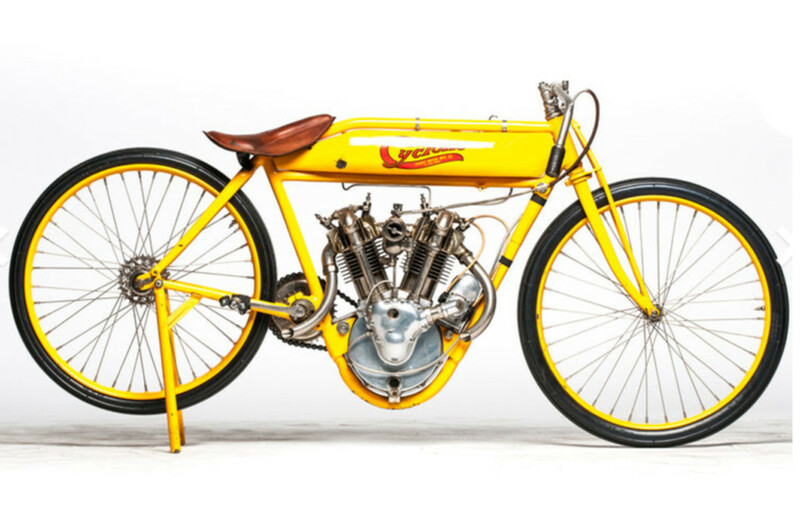 Why is it so rare a machine with important history comes up for sale with solid-gold provenance?